As many of you know, Mr. P and I come from different cultural backgrounds. One of the things I’ve enjoyed most in our relationship is learning and trying the foods from his culture and introducing him to the food from mine. It’s always a thrill when Mr. P ends up loving something that I grew up with. 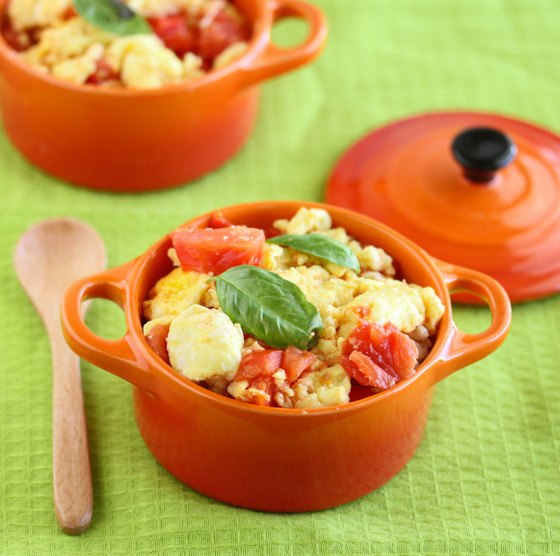 This tomato and eggs dish is one example. It’s a very classic Chinese dish. It’s made often in Chinese households and is one of the ultimate comfort foods. I cooked this for Mr. P for the first time about a year ago and he instantly loved it. 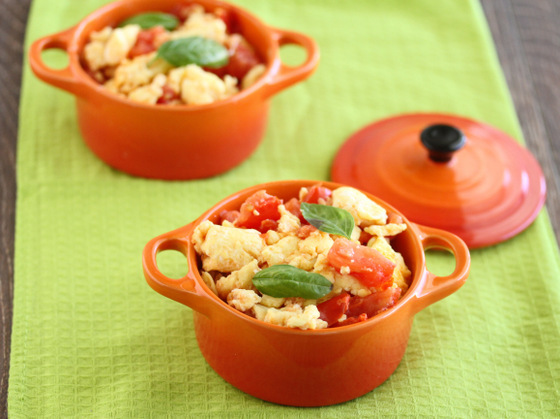 The tomatoes and scrambled eggs pair very well together. The tomato juice add both a savory and subtle sweet element to the dish. You can season it as you like, but I usually just do some salt and pepper and sometimes I add a few basil leaves. It’s best enjoyed with a bowl of rice. Spray oil on pan and turn oven to low heat. Whisk eggs in a small bowl. When pan is heated, pour eggs in. As eggs begin to cook, stir them so that they scramble and don’t stick to pan. When eggs are cooked halfway through, add in the chopped tomatoes, salt, pepper. About 1 minute before done, add in fresh basil leaves. Stir and cook until done. Serve with rice. I love tomato and egg! Marriage & Laughter Copyright © 2012 - 2019 All Rights Reserved.